Chelsea wonderkid Tammy Abraham has been sounded out by representatives of the Nigeria Football Federation over the possibility of playing for Nigeria instead of England at international level. The NFF did not get a positive response from the player and his dad, with the young striker stating that he is focused on representing the England youth teams. 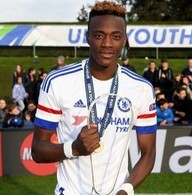 Born in London 18 years ago, Tammy Abraham is being touted as one of the top young players in England and has netted 7 goals cumulatively for the U18s and U19s team of England. “Tammy Abraham is a Nigerian and we have approached him regarding representing Nigeria, ” Team Nigeria UK chief David Doherty told allnigeriasoccer.com. “We spoke to his dad, met with him and his dad. The chances are that in future he could play for Nigeria if England Three Lions is not certain. Abraham has been named to England U19s roster for the upcoming European Under-19 Championship in Germany. He made his Premier League debut against Liverpool on May 11 before he was given another run out against Leicester City on the final day of the season.